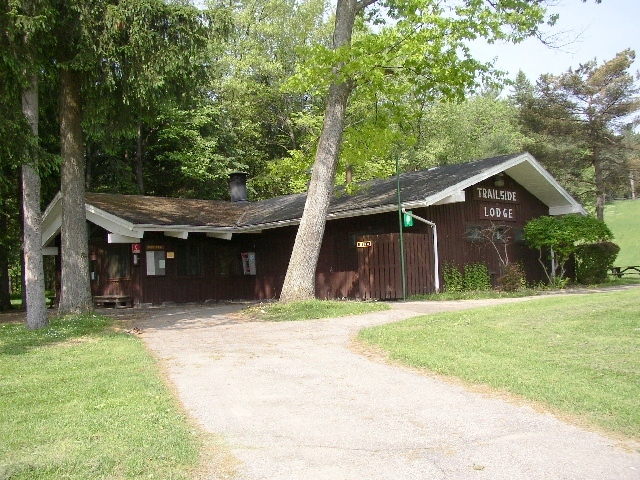 The very popular, and well used, Trailside Lodge will turn 40 years old in 2013. Its origin is one of those stories of response to public pressure and kind of a fad but demonstrates the resoursefullness of the Park staff in those years. I joined the park in the late 60’s and at that time the area was covered in conifer forest just like that which surrounds it today. In those years ski areas in western New York were growing in popularity. One example is Honey Hill, now closed, that existed on the west side of Route 19 south of Warsaw NY. I am not exactly sure how it became available but in those years a rope tow apparatus was offered to the staff at Letchworth and the chance to provide a new and popular park activity was too hard to resist. Thus plans for developing a ski hill in Letchworth evolved thanks to provision of the mechanical parts needed to create a rope tow by our sister park, Allegany State Park . Fortunately we still have James E M Stewart, Professional Engineer, and Jan Vrooman, Landscape Architect to ask questions about these plans. There were very specific requirements for safe operation that were enfored by the N Y State Department of Labor so attention to detail was a critical part of the engineering. The hill behind what is now Trailside was selected as the Ski Hill, the land was cleared and graded, a small building was created at the top of the hill to house the equipment for the tow. Likewise a small building was constructed at the reverse side of the hill near Troutpond to house the high pressure pumps needed for the snow making equipment that utilized trout pond water. These features were done by park employees - the mechanics worked the engine that came from a 1938 Stewart Truck. The buildings were all done by park carpenters led primarily by Fred Robinson. Letchworth State Park now had a ski hill that, at that time, became very popular when first used by the public in the winter of 1969. However as other businesses developed and became more sophisticated with chair lifts and other amenities the park operation was discontinued we think by 1977. This was partly a business decision and partly a financial one because of the legal requirements of tow operation. Also, the staff needed was not available on the typical winter time budget for the park. The small pond for ice skating was popular as well until the impervious clay liner began to leak and natural invasion by cattails interfered with ice development. All these things combined offset some aspects of the area but did not reduce the popularity of the winter use because the use of inner tubes mushroomed. There was a time when the state was able to provide enough tubes from patched up things from the maintenance department but that was short lived. Next came purchased tubes and the appearance of the commercial ones available in bright colors and slick surfaces. Night use was possible because the ski hill lights were still there. Through all of this the common complaint heard was that there was no warming shed that could accommodate those who loved the winter exposure but did get cold hands and feet. Note also that up till now no mention of toilet facilities is made. Thus the idea of a lodge was born, the engineering section went to work and the lodge was designed and with very little expense the building was erected by park personnel. In those days the park had two of just about any tradesman you could mention. This included a skilled person named Clarence Flint in the sawmill who milled the pine that was cleared from the site into the lumber used to build Trailside lodge. That beautiful knotty pine on the inside of the lodge was once the trees that grew on the hill. Staff of the engineering section included Bob Smith, Russ Chapman, Chet Walek, Francis Foote, and Charles King who is also still a valued source for this website when questions arise. Now it was noted by the administration that the area was known as the “Ski Hill” and yet that use was fast disappearing in favor of multiple other uses and with the added advantage of a year round facility that would meet an additional demand. The Regional Administrator at that time decided a contest among staff would be a good way to come up with a more suitable name for the facility and a free dinner at Glen Iris Inn was used as a carrot to develop interest. I was an Assistant Land and Claims Adjuster at the time with a desk in the engineering room where I was aware of all the elements of construction even if it was not in my title , and much of my duty centered on land use in the park and development of parks in other municipalities. I had wandered that whole area in winter and summer and knew it was replete with trails, both man made and “deer trails” so the name was a logical one from my point of view. The Memo form that accompanies this article was what was eventually given to me and posted on the office bulletin board for all to see. I was elated that my entry was accepted and I took the Memo home to show my wife -- little did I know she would preserve it for forty years. Do you have a favorite family picture of the Ski Hill or Trailside Lodge? Please send it to us! 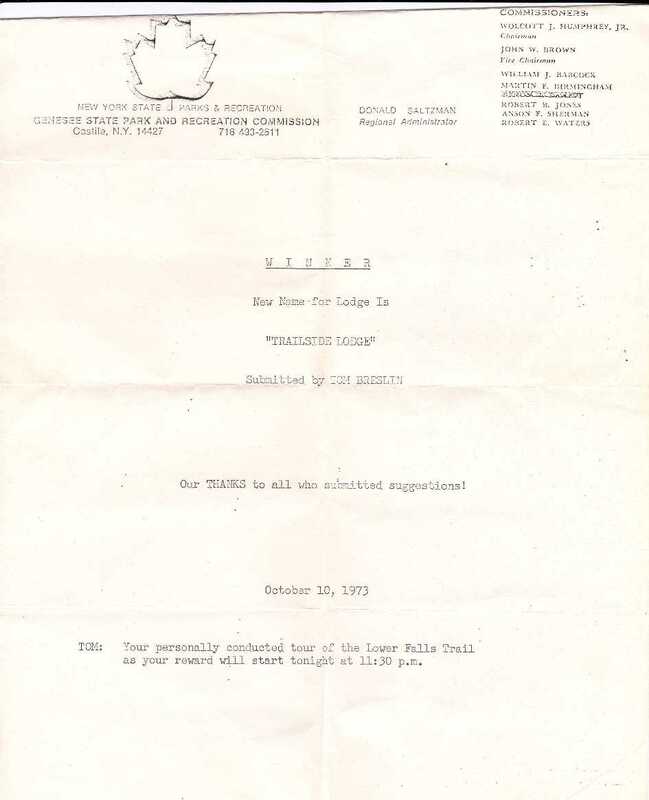 The document below shows documents the naming of Trailside Lodge.